The energetic and sometimes even arrogant Pomeranian is a tiny dog with a big personality. Somewhat inquisitive and always playful, they enjoy games and any adventures they can be involved in. They make exceptional watchdogs, but with their small size they tend to be very little protection when needed. They tend to steer clear of strangers that may enter their homes and they can bark as well. They are friendly toward other pets, but not very friendly when around other dogs. Their overconfident attitudes can be a challenge when training them, even as pups. They can easily survive in warm or cold climates, but should be permitted to sleep indoors. While the Pomeranian appears full of life, they generally do not require very much activity. A walk everyday will certainly satisfy their cravings. They bode a thick and full fur coat that can certainly keep them warm when needed, but they shouldn't reside in an outdoor environment all the time. They will require a fair amount of grooming on a weekly basis to maintain their fur coats and keep them clean and free of debris that can become trapped inside of it. The Pomeranian can develop a condition called patellar luxation, which is extremely common in just about every breed of canine. Some minor issues that can develop are shoulder luxation, PRA, open fontanel, hypoglycemia and entropion. In rare occasions they can experience PDA and a tracheal collapse as well. The vet may recommend screening on their eyesight and their knees as they age. The average Pomeranian lifespan is from twelve to sixteen years long if tey are cared for properly. A small dog weighing around three to seven pounds and standing only eight to eleven inches tall when they are fully grown. Deriving from the family of Spitz dogs, the Pomeranian was initially bred in the 18th century. The Spitz family of canines was well known for their exceptional sledding abilities, but the Pomeranian is far too small in size to carry on such as tradition from their ancestors. Experts believe the Pomeranian was originally derived from the Deutscher family of dogs and somewhere in Germany during the early 1800’s. 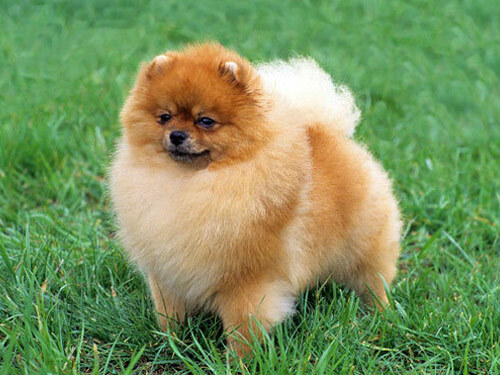 Once they made their way to Great Britain, they gained the name Pomeranians, but they were better known as Poms once they became more popular in recent times. Like many other dogs, once Queen Victoria got her hands on one of the Poms, they gained instant fame. The Queen got her Pomeranian from Italy and back then they were much larger in size and hers were all gray in color, not the popular brown and auburn shades of fur many see so often today. Once the 19th century came about, the Pomeranians received their nod from the AKC in the early part of the 1900’s. Since then, they have become a dog show favorite and now being bred in a wide variety of fur coat colors in the United States and England. Many young females desire this type of dog as it has been made popular in the USA as the perfect little lapdog.